This afternoon saw the launch of the new Penfold’s collection. 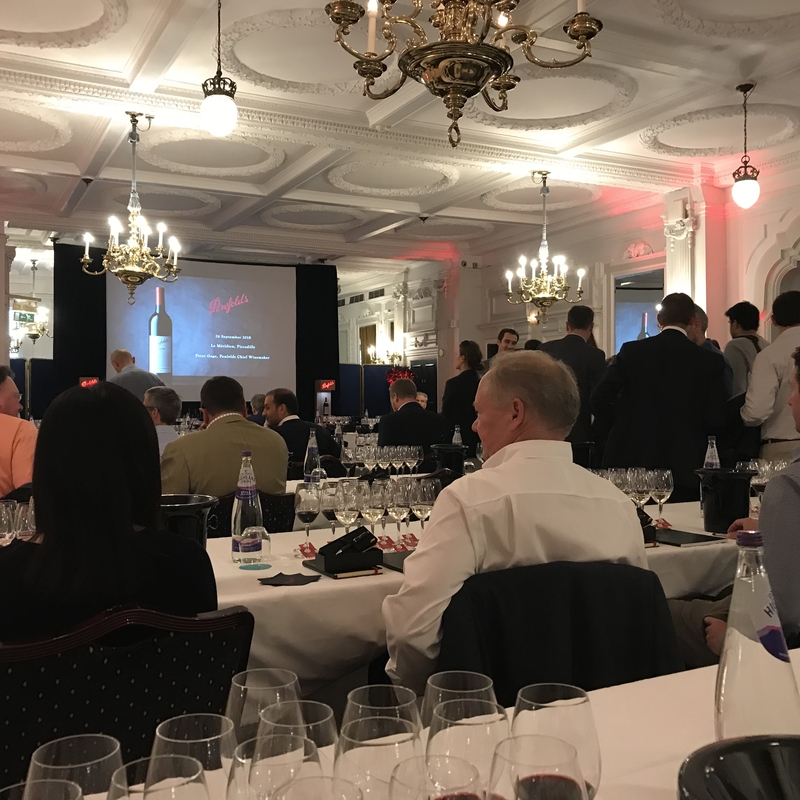 It is a ceremonial event, the London leg beginning a global fanfare, which sends the evergreen and charismatic Peter Gago, Penfold’s Chief Winemaker, on a global tour. It is noteworthy, that there have only ever been four Chief Winemakers at the helm of the Penfolds fleet, Max Schubert, Don Ditter, John Duval and Peter Gago, their custody running back 170 years: obviously not consequentially; Penfolds is not the secret elixir of life. There is a soft, unspoken embargo established, which means commentaries on the wines are not allowed until the launch date which will be on 18th of October; so, I will be vague. Penfolds famously produce wines in perfect dichotomy; multi-vineyard, multi-region blends, spanning much of South Australia and some outside of this expanse: in contract to sub-regional and single vineyard plots, they virtually produce a single block wine. Indeed, they are world experts at fashioning multi-varietals and make some truly great single varietals. For nearly 200 years, these three distinct styles have influenced their philosophy. The single block varietals are celebrated and revered, they speak of terroir and a sense of place, in a vast continent: Magill Estate Shiraz, Kalimna Block 42 Cabernet Sauvignon, Cellar Reserve Kalimna Block 25 Mataro, and Bin 170 Kalimna Shiraz. Moreover, the single region, or sub-regional wines represent the best of a common style: RWT Barossa Valley Shiraz, Bin 128 Coonawarra Shiraz, Reserve Bin A Adelaide Hills Chardonnay, Bin 150 Marananga Shiraz and Bin 23 Adelaide Hills Pinot Noir. Finally, multi-region and multi-varietal blends exemplify the best of what makes Penfolds great, the art of crafting a house style. Penfolds Grange is their epitome, yet their flagship has boldly cut a path that has led to other examples of this style include St Henri Shiraz, Yattarna and Bin 389 Cabernet Shiraz. Any broad brushstrokes on vintage or style are generally misleading; if Penfolds have a singular unifying characteristic it is precision. That said, the Penfolds collections show beautifully balanced alcohol, good freshness, while maintaining full-flavour and nuance. Focusing in on the finer range of whites the triplet of Chardonnays provides and evolution of style. The Bin 311, which derives from Tumbaraumba in New South Wales, is the best value of all their whites, priced typically at under £100 per case of six, it is an appealing toasty affair with plenty of orange peel and nuance at this price point. Climbing the scale sees their Bin Reserve Chardonnay, which comes from Adelaide Hills, the vintage this year is 2017. It costs around £250 a case of six and at this price point, certainly rewards, standing up to 1er Cru White Burgundies and Napas at this price point. Their Yattarna Bin 144 2016 is another story entirely, which at around £460 is the acme of their white winemaking. The range of reds runs through more Bins than can be mentioned here, yet recognisable from their ubiquitous presence in supermarkets. However, Bin 389 or Baby Grange 2016 stops the show and is removed from their entry range. Explainable by the fact large components of the wine are matured in barrels that held the previous vintage of Grange. It releases for around £30 a bottle and doubles overnight, due to its incredible demand from Asia! Magill Estate Shiraz 2016, derives from the Magill vineyard, on the outskirts of Adelaide and a single take on Grange itself, while RWT 798, again 2016 this year, represents a single region Barossa Valley Shiraz, breaking the mould in an old-world style, matured only in French oak. Indeed, this mirroring repeats brilliantly with 100% Cabernet Sauvignon Bin 707 2016, a wine profoundly loved in Asia, a multi-vineyard, multi-region that exemplifies power and torque. This is once again juxtaposed by the superb Bin 169 2016, which reflects this while aged in fine grain French Oak. Finally, of course the two masterpieces. St Henri and Grange. St Henri is the Ying to Grange’s Yang, created deliberately to challenge Penfold’s Grange (Then Hermitage Grange) by juxtaposing it; where Grange was viewed as polemical, St. Henri was designed to use conventional winemaking techniques, an alternative expression of shiraz and a brilliant counterpart to Grange. The release is the 2015 and at first glance promises to be one of their finest ever, one of the best value wines in the world at around £300 a case of six. Finally, Penfolds Grange broadly considered as the greatest Shiraz in the world and the best wine from Australia; its story is fascinating and as special as the wine itself. A wine so great that Peter Gago sees his work as only a continuation of a legacy, a style and transcending masterpiece, the finest multi-vineyard multi-district, blended wine in the world. This year the release is the 2014 and Grange reflects the vintage in a cooler, fresher, more elegant style. To buy any wines by Penfolds, please click here.